Are you looking to improve your gas mileage? Or maybe you want to add more horsepower and torque to your F150? Why not do both! With the help of a good tuner, anybody can give their truck better fuel efficiency and performance. If your are planning on buying one, why not buy the best on the market, the SCT 7015 x4! This tuner puts control into your own hands, allowing you to work on Ford without having to hire a mechanic or run to the dealership for checkups. Makes sense, right? What is the best ECU Tuner for a Ford F150 ? Engine remapping involves replacing or altering the software in your truck’s ECU, changing how it performs and potentially removing any restrictions on its potential. The old way of doing this involved swapping a circuit board or chip inside the ECU. Nowadays, companies like SCT make it extremely easy for everybody to do this to their truck with the help of a handheld tuner. It can be done in a matter of minutes by plugging the device into your truck and simply loading a custom map onto your ECU. This tuner is serious about customisation. It works with a huge variety of different Ford cars and trucks, from 1996 to present, so you are not limited to your F150. The SCT x4 is compatible with both gas and diesel vehicles. In addition to this, it increases horsepower and torque while allowing you to choose exactly how much or how little of an increase you want. To top it all off, the SCT 7015 X4 Power Flash tuner lets you set and store up to 10 completely customized calibrations on the device. You are also given access to a special cloud storage for saving even more settings. This is the first, and only tuner on the market that allows you to save your configurations on a cloud storage system. 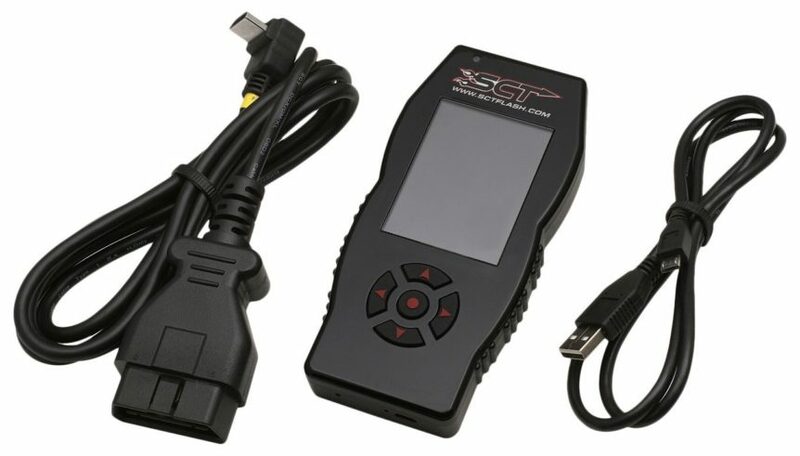 As well as customisation’s, the SCT 7015 X4 Power Flash programmer allows you to log and monitor your vehicle’s computer system. This is a pretty awesome feature that you can use to keep track of all your modifications, and see how they are impacting performance. You can also check on computer error codes, turn off warning lights and fix any glitches in the system. What Can you adjust with the SCT x4 handheld tuner? Here is a list of some of the parameters that can be adjusted with this device. Don’t worry if you are not sure about adjusting specific settings, the most common method used on this tuner is downloading pre-built tunes. These tunes are custom made for your truck model, and have all the settings optimised. Check out the video at the bottom of this post to see this tuner in action! If you’ve come to this page, you may already know what a tuner is and the benefits of installing one on your truck, but not everyone knows just how beneficial they are and what the heck they really do. Well today, I’m going to explain what exactly a tuner does, what the benefits are, and the reasons why you are crazy not to have one! When trucks leave the factory, the ECU comes with conservative software settings, including the power settings. These settings help the truck be more stable under a variety of different conditions, but it also means there’s some power left behind. Chip tuning can change the fuel/air ratio and timing to give your truck that extra power and torque. It is incredibly effective on turbo diesel engines, often boasting 25%+ power increases safely. Its no secret that the F150 is a big gas guzzler. This is the reason why many owners opt to buy a tuner. In the past, tuning your truck was focused solely on increasing power and torque, with little concern about fuel economy. Nowadays, that is not the case. There is an abundance of custom tunes available that will increase your Ford fuel economy. By optimising power and torque to the low to mid end rpm, you will gain better throttle response, less flat spots and a smoother power delivery with less gear changes. This means your truck requires less fuel to travel the same distance. At less than 400 bucks, this is by no means an expensive upgrade. You will save more than the cost of the tuner within one year, just by the increased fuel economy. When compared to other mods like a custom exhaust, the tuner will give much more performance gains for a lot less money. There is no labour costs with a tuner, as they have a simple plug and play design. A good tune will insure that your fuel is burned as efficiently as possible. This is done by altering the timing, fuel/air ratio, injection, transmission, and more. By giving a much cleaner fuel burn, there is less build up on your trucks parts, resulting in less servicing and repairs. If you’ve made it this far, then hopefully I have managed to give you a clear insight into the world of F150 tuning. Maybe you were unaware of the massive benefits of using a tuner on your truck. I can’t really think of any cons to using one. If you already have a cold air intake, high flow exhaust system, or similar mods, you will see massive performance gains when you install a tune. Have a look at the reviews on Amazon, its as clear as day that this is the best tuner on the market for your Ford. I love how easy it is to switch between different tunes in a matter of seconds. This allows me to make quick changes for when i’m towing, off-roading, or daily driving. We would love to hear our thought on this tuner, feel free to drop a comment below and tell us what you think. Keep on truckin’ mother Truckers!